Wow! What beautiful days, this is one of the reasons to live in North Carolina, what seems like weeks of clear blue skies and temperatures in the 70’s. Even the building pollen storms are not enough to take the luster off. But spring in North Carolina has one devilish side that most people don’t realize. Late spring frosts. We are in one of the worst frost “pockets” in the eastern US here in central North Carolina. This is why we don’t have much tree fruit at the Carrboro Farmers’ Market. With all of these beautiful days the fruit trees (and other flowering things) get going like gang busters and then a cold front rolls through and the blossoms get zapped, result- no fruit. Our neighbor Henry (who grows and sells fruit at market) says he is lucky to get fruit two out of five years, especially peaches. Our frostiness has to do with soils, latitude and intermediate elevation. 50 miles south in the Sandhills, where the peach industry is, the sandy soils there keep the air just a little warmer at night. Up in the mountains, where the apple industry is, the slopes and the elevation keep things cooler later so the trees don’t bloom too early. What does that have to do with Peregrine Farm? Our fruit trees are tomatoes. We gamble with the very early ones in the sliding tunnels, putting them in a month before our last frost date of April 21st. While that one thin sheet of plastic gives them some protection it won’t protect them down to lower than 28 degrees. When these cold fronts roll through we are always on guard for “the cold night”. The weather folks are always excited about the first cold night after a front comes through but our experience is that the second night is the worst. The first night usually still has some air moving around to keep the temperatures from diving. The second night it usually gets very still and the temperatures drop fast. Such was the case this last weekend, Saturday night it cleared off late and the temperatures stayed up. Sunday night-Monday morning it was very clear and still, 26 degrees out here at the farm! 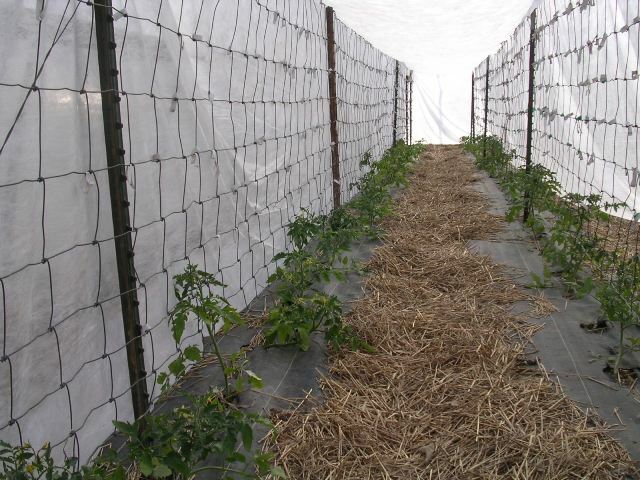 Fortunately we felt it coming and tucked the tomatoes under an additional layer of protection of row cover, suspended over their trellises. All happy and warm, no damage. The moral here for most folks is don’t plant those tomatoes into the garden until the last week of April unless you are prepared to cover them. Our big planting is not slated to go in the ground until the week of April 24th, it should be safe by then but we will be keeping a close eye on the weather for sure! The most critical job this week was moving the tomato and pepper transplants up into larger containers. We start them all in small “cells” so we can maximize room in the germinating chamber. After they have grown for three or four weeks we then move them up to larger size cells so they have bigger root balls to go into the field with. Large root balls mean stronger, faster growing plants and earlier fruit. It also gives us a chance to choose only the best of the small seedlings to move up. The critical part here is not to screw up and mix up all of the varieties. With 22 varieties of tomatoes and 25 of peppers it is easy to do. I have a spread sheet of the varieties with the number of plants to move up that I give to the staff and then get out of the way! I have found that confusing conversation generally leads to Aunt Ruby’s German Green being labeled as Dorothy’s Green or worse. Tomatoes nestled all snug in their beds with visions of BLTs dancing in their heads!